A few weeks ago, I was contacted by the people behind the company, Stencil Revolution, to see if wanted to try for their stencils for some craft projects. After scrolling around their site for a minute, I totally impressed with their selection. They have so many choices! But, what really caught my eye was the small word stencils. Come to find out stencils and quilling work great together, and this week, I’m sharing how! My thought was that I would use the stencil to make perfect quilled letters in way less time. I’ve seen some quillers using thier Circut or Sileuette machines to make fancy script outlines to add quilling paper too. But those machines are really expensive, and there is quite a learning curve to them. I had a feeling I could get similar results with the products from Stencil Revolution. The first step was to lay stencil down on paper and trace the outside. I used tracing paper for this, because that was what I had in arms reach. Next time, I would use regular drawing paper, so I could see the tracing a bit more clearer. Then, I added wax paper over top and pinned both to my cork work board. After the tracing was done, it was time to get creative! I started adding quilling paper, by lining up paper on the edges of each letter and trimming it to fit. I chose to use 1/4″ paper because I wanted a little height, and a bit more weight to the paper. I definitely had to use some pins to keep everything in place. Also, maybe dip the ends of your paper in glue with tweezers, since some of the strips will be really tiny. When the outlines were finished, I filled in the letters with swirls and lines. I also added a teeny red heart to replace the dot in the “i”. I knew I wanted to make a small plaque with my quilled words, so I had to find the base. To keep my project lightweight, I used a thin wooden plank, and painted it dark gray. 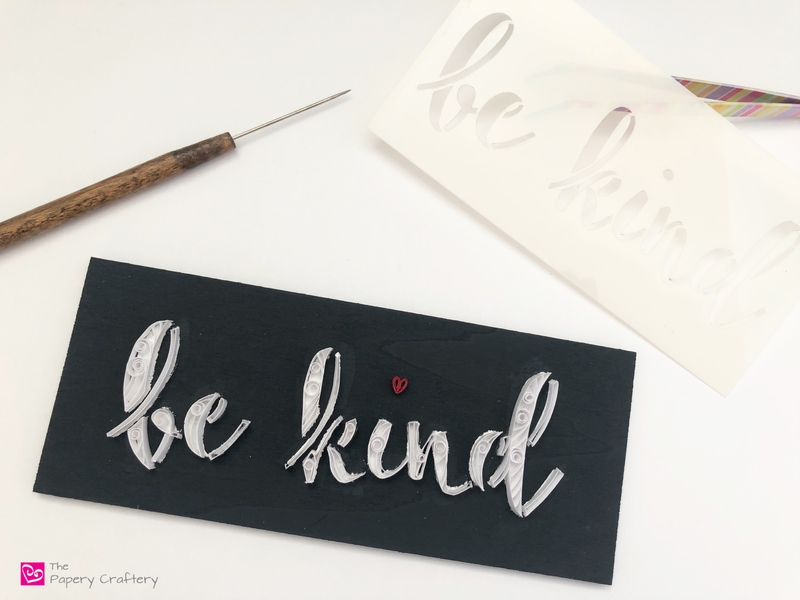 I really wanted the “be kind” phrase to pop on the gray paint, so I again used the stencil to add the words in white paint first. The was some touch up needed to some of the gray once I took the stencil away. I should have picked up a stencil brush before I did this part so I would have had less bleeding of the white under the stencil. When I was happy with the painted script, I was ready to glue the quilled letters right on top. I peeled the quilled letters from the waxed paper and trimmed any excess dried glue off the bottom and edges. Again, dipping the quilling into glue seemed to be the best plan. Be sure to use just a small amount of glue, and brush away any extra. You can see from the side that this was not a perfect project. After adding all the quilling, I still had some touch-ups to make with paint. I’m pretty happy with the look straight on, though. Especially for a first try. The sweet little heart make me smile! I learned a lot from this project about working with stencils. On my next attempt, I think I would use paint to stencil the words on the paper before I started quilling. I found that the pencil tracing was all around a little smaller than the painted stencil, which made it so I had to do many touch-ups. But I love the idea of using stencils with quilling, because the possibilities are endless, especially if you’re looking to recreate the same design over and over for a business. If you do get a chance, check out the options over at Stencil Revolution. They’re a family run business from Florida, and their stencils are easy to use and made from durable Mylar. I also grabbed one of their floor tile stencils to use in my laundry room. I’m so excited to bring some personality to that dull space! If there’s any expert stencilers out there, I’d love some tips. Be sure to leave your thoughts below in the comments! I love the idea of combining stencils with quilling and enjoyed reading about your first attempt. I like the “Be Kind” plaque and may try something similar. I will definitely go to the Stencil Revolution website to explore what they have. I enjoy your blog. Please keep sending new ideas and tips. Thanks Susan! I hope I got some of the mistakes out of the way so you don’t have to make the same ones! Let me know how it turns out. I liked your idea of using a stencil to quill. However, wouldn’t it have been easier to just use the stencil itself as a guide, like those quilling guides that have circles and other basic shapes of various sizes you can use so that you will have consistent sizes. You could pin or thumb tack it to your cork board instead of making a paper tracing and using it. I haven’t tried it myself, so there might be some hang up, but just an idea I think I will try. Absolutely, Allyn, that was my first idea too! But I found it was a little tricky to pull the stencil off without damaging the quilling inside the openings. It would probably work better with a stencil with larger open space, but I couldn’t get that technique to work for me. Great idea using the stencil. It looks fabulous. I love the little red heart for the dot of the eye. Thanks, Kathy! The heart is my favorite part, too.